It's Monday, so it's time to get organized for the week! How many of you use a planner or journal of some sort every single day to keep your schedule and tasks under control? Surprisingly, not many! 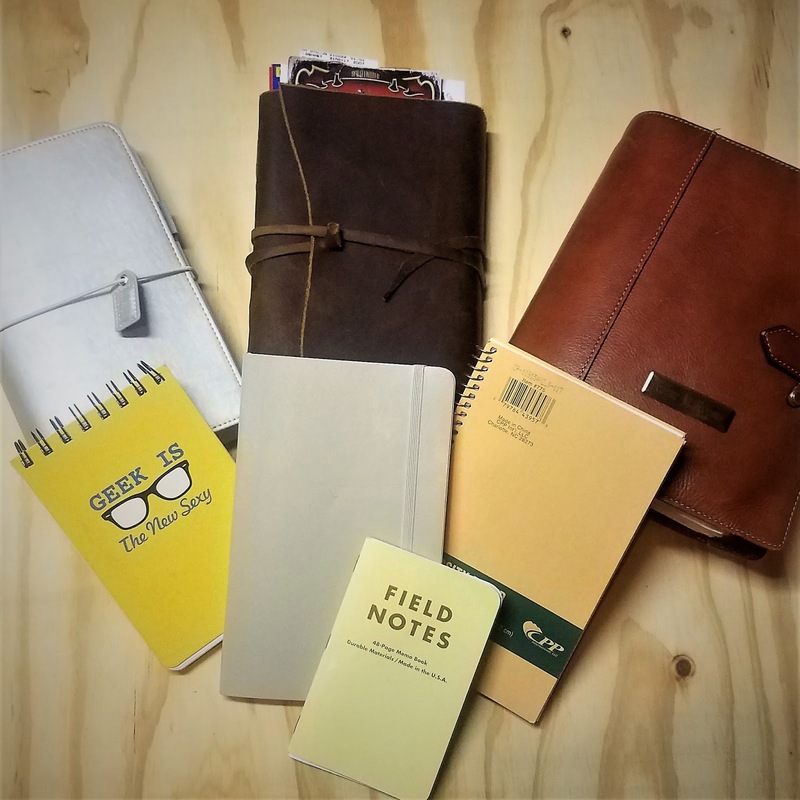 The journaling world is exploding right now, with all types of supplies, ideas, and even social media accounts dedicated to it. And yes, that means a lot of us are joining in the fun! But I haven't seen many examples of a true daily plan. And none of them for someone who is trying to manage a home! As always, it should go without saying, I am NOT simply representing the stay-at-home-mom/housewife. I am including women who also have a full time career outside of the home, and even the men who are tackling the role of home manager. 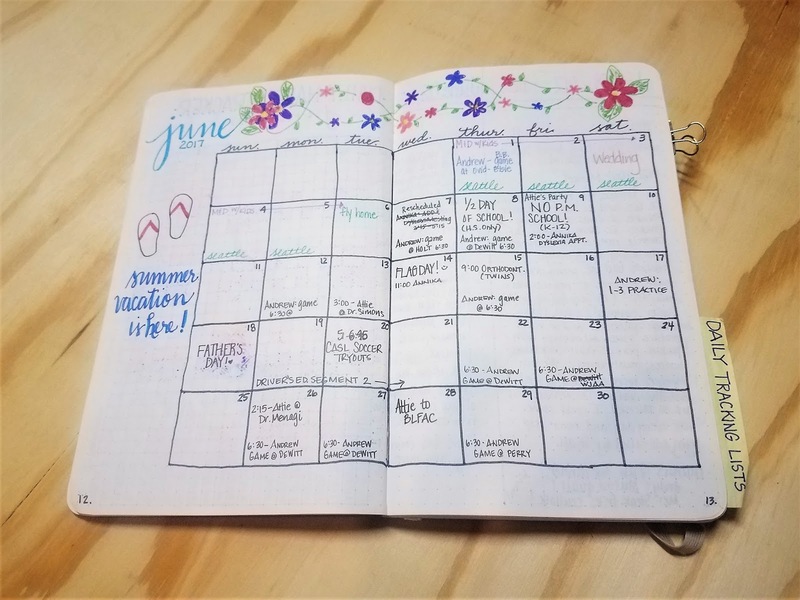 So many of us have a planner of some sort and it gets used to track meetings, projects, deadlines, appointments, and all of those typical events we would keep track of for work. And we throw in the dentist appointments and soccer games for the kids just to make sure that we don't schedule something for work in that slot! But do you ever make a note of what laundry needs to be done? Chances are, at some point, you're about to walk out the door for a soccer game and realize that the uniform isn't clean! It's not that you are a terrible parent - it just got lost in the shuffle of everyday life, and let's face it, if we don't write something down we tend to forget about it! Have you stopped to consider a system for everyday tasks? Would you like to see what it could do for you? This doesn't have to be a time consuming, artistic endeavor (unless you want it to be! ), and it can be as simple as a small spiral bound notebook or a full-blown planning system that you can buy all kinds of forms and pages for, or even fully digital using a planning app. For now, let's just take a look at a very simple way of doing this. And perhaps get the uniform washed for the next game! The photo above shows my current planner/journal collection. I am a bit fanatic about keeping lists and schedules, and I don't expect anyone to try and keep multiple volumes! But each of these has a separate purpose. The metallic notebook at the top left is for a weekly re-cap of fun events and memories to keep; the top center is an art journal that I sketch and create watercolors in of all the places I travel to; the top right Franklin Covey planner is the one I use for organizing all of my blog activities; the yellow 'Geek' notebook is what I carry in my bag for writing down longer notes and ideas so I don't forget them; the center right spiral bound notebook is the one I keep in my nightstand to make quick notes of things that pop into my head before I fall asleep; the Field Notes notebook is another that I carry in my bag for those one to two sentence notes that I make when I'm away from the house and then later transfer into either my daily planner or my work planner. In the center? That is my holy grail. 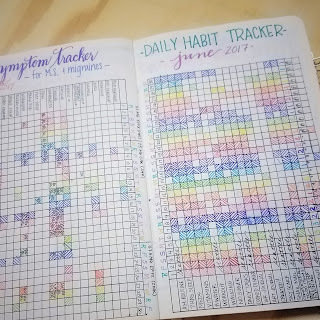 That is my daily bullet journal, or bujo as they call it in the journaling universe! This is my lifeline to make sure that I get through my day organized and productive. 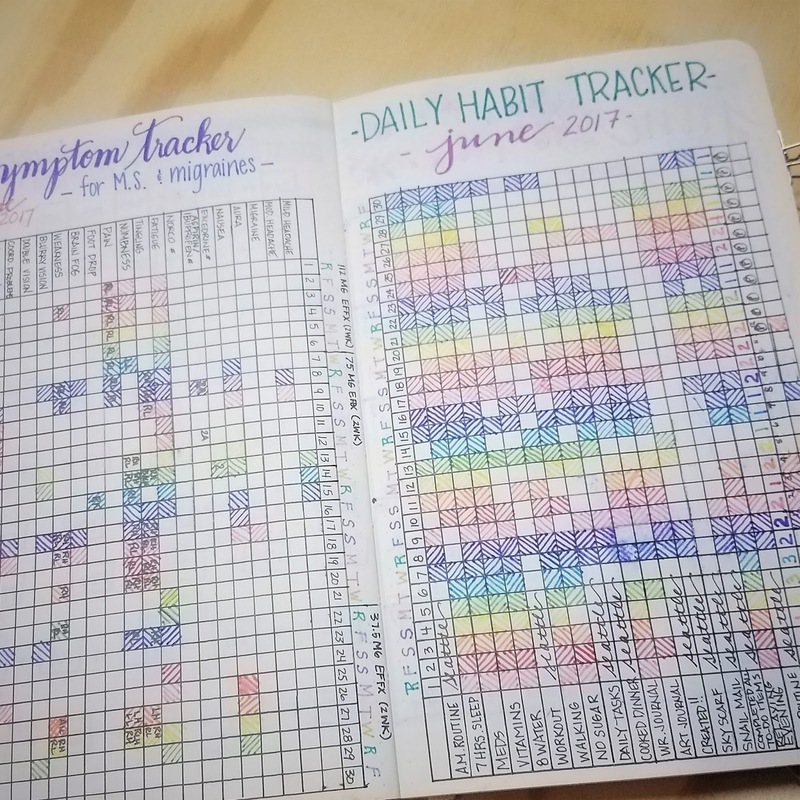 Each time I check off a task or appointment in here, not only do I see progress being made on projects around the house, it also gives me a wonderful sense of accomplishment! I feel like a better mother, wife, and homemaker knowing that I am getting everything done! This little lifesaver is a Moleskine Classic Dotted Notebook. I have used several different notebooks over the years, and this one is really working well for me right now! I can customize it however I like with the dot-grid pattern. In the past, I had always used lined notebooks, but when I switched to this style I found a new freedom to use my planner in ways not possible before. 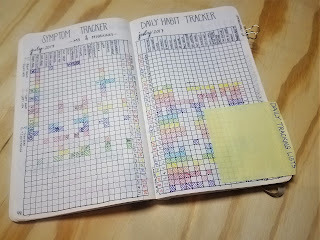 I can create little tables, checklists, trackers, and more simply by 'connecting the dots'! I also use a Sharpie Pen to write in it; it doesn't smear and there is very little bleed-through. This is how it looked for this past weekend. My layouts have really evolved over the years, and I think this is the one I am going to stick with for a long time. I am going to walk you through a condensed version of how I set it up, so you can get a good idea of how this works for me! 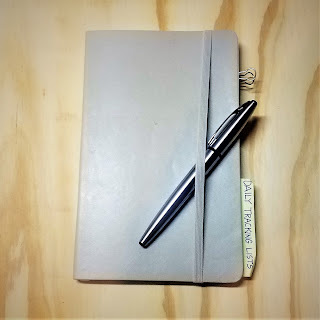 Most people begin their bullet journal with an index. This is basically a table of contents, showing the entry and corresponding page number. Honestly, that's too intensive for me. I rarely ever go back to refer to an old entry. And if I really do need to? This isn't that large of a volume that I can't just flip through a few pages! 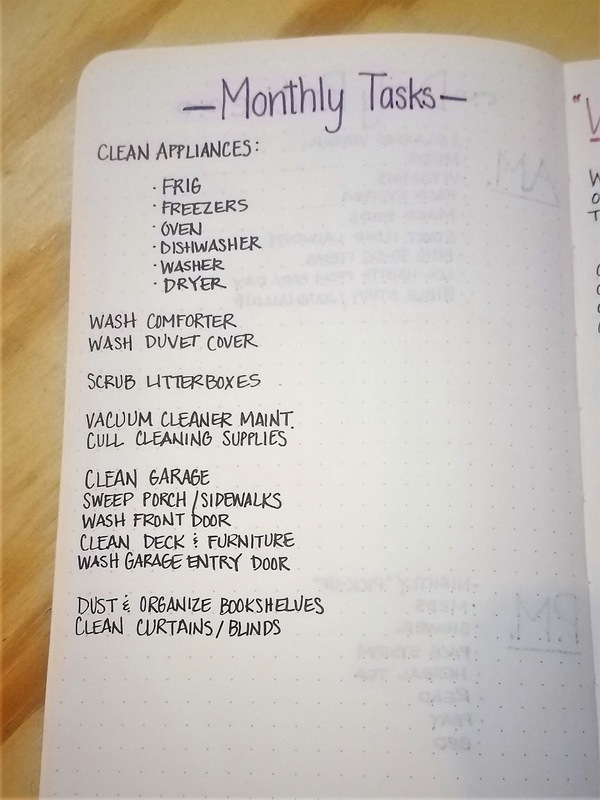 I began mine with a master list of monthly tasks. 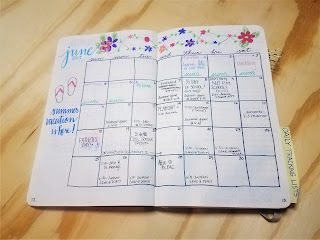 I refer to it at the beginning of the month when I am starting my new layout for that month. 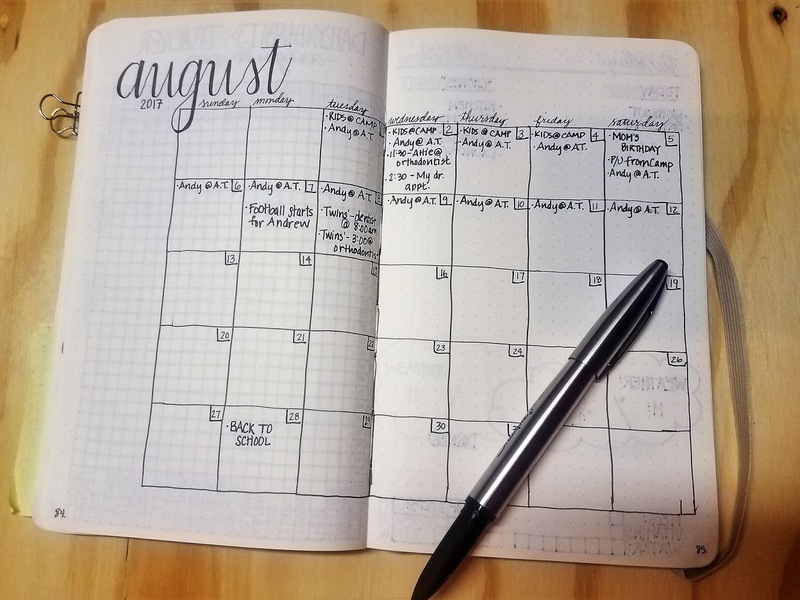 I use it to make sure that I include those tasks in my to-do lists throughout the coming month, and check them off the list on the day that I did them. It keeps this list clean and what it is intended for: regular things to pencil in each month. So far this has worked very well for me! 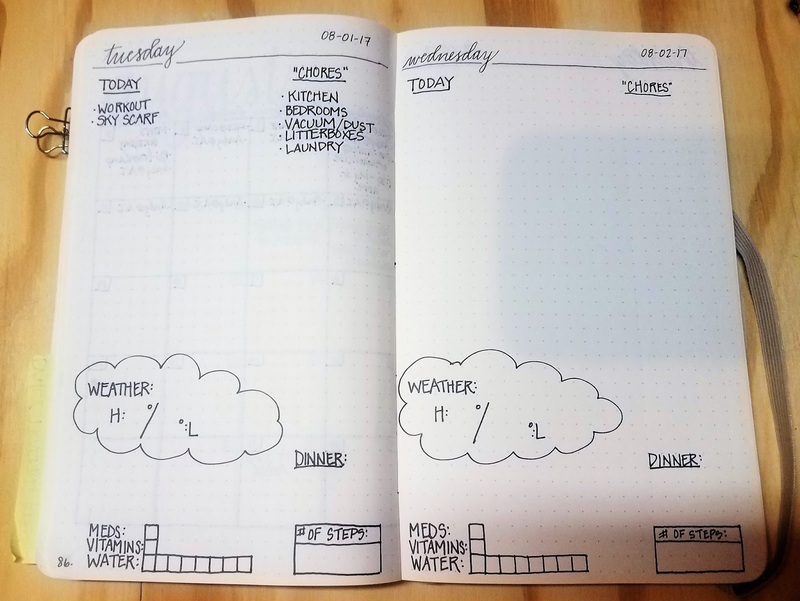 After the daily tracking pages, I create my 'monthly spread'. This is the master calendar for the month. I don't include blogging or social media items on this calendar; this is only for household or family related items. Since I spend set hours each day as my work time, I keep all of the other calendar items in the work planner. That way it doesn't cloud the really important things in my everyday life! As an example, here are the June and July "monthlies". 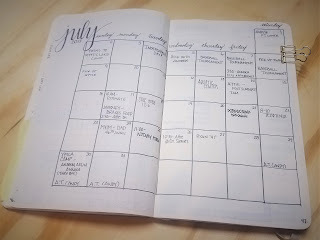 I'm still adding things to the July calendar as they come up - there's still a week to go! I've already added items to the calendar that I know are coming up. 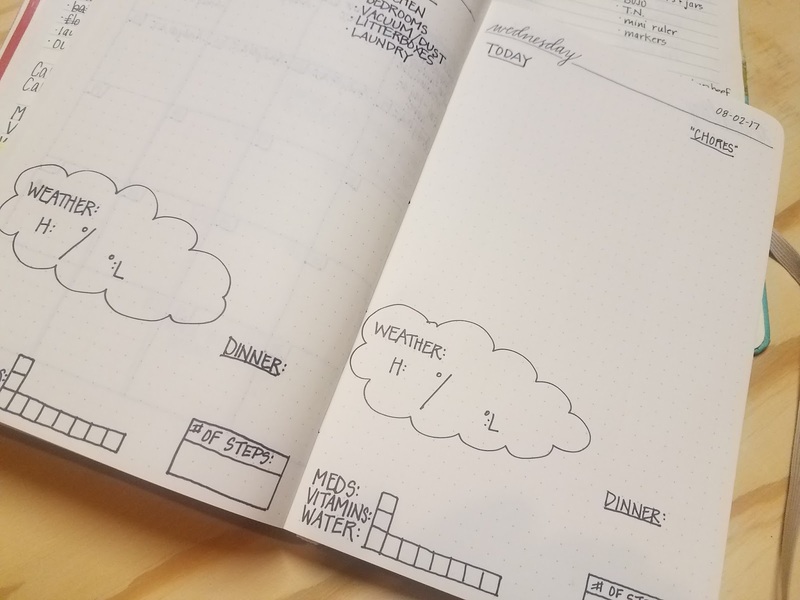 I'm sticking with this layout because it really works for me; I like being able to see the entire month in advance, and viewing it as a traditional calendar is the easiest way for my brain to process it. Some people create it as a numbered list, bullet list, or only a week at a time. You do whatever works for you! 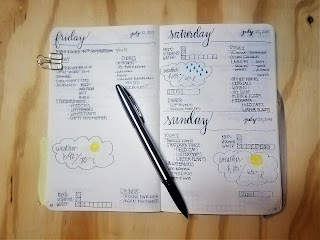 I like to keep it simple, but still be able to track everything that needs to be accomplished on that day. For example, I always have two main lists. Under the "TODAY" heading, I note down anything that I want to make sure I get to and any appointments/time scheduled for that day. Under the "CHORES" heading, I list out the household tasks that need to be done. As you can see, I already have a few entries in these two columns. I know that with four children and three cats, I need to clean the kitchen and the litterboxes everyday. I also need to vacuum everyday, and dust every other day because of those same children and pets! On Tuesdays, the bedrooms get cleaned. And I do laundry. Every. Single. Day. Under the laundry entry, though, I will add some sub-notes. I'll add bullet points for what laundry needs to be done. The everyday laundry is always going to be one load containing the kids' clothes from the previous day. If I don't follow this system, the backlog would be so overwhelming! There are just too many of them! But I may add a note to do a load of kids' bath towels, or all of the kitchen linens, or a sanitizing cycle of all of the cleaning rags.... I also make a note each day to workout (seeing it crossed off makes me feel so good!) and to work on my sky scarf (I knit a row each day that matches the color of the sky that day). You can see that I have also added some graphics at the bottom of the pages. 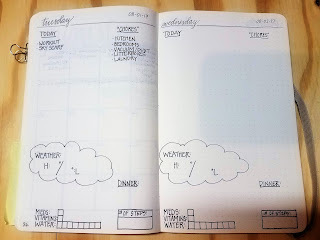 In the little cloud, I record the weather for the day - high and low temperatures, and a little drawing of a sun, raindrops, or cloud - to keep track of what the sky looked like in case I don't get a chance to knit my row for my sky scarf project! I include boxes to fill in as I drink water throughout the day or after I take my medications/vitamins. This is just to remind me to get my 8 glasses a day and to stay healthy! I also record how many steps I took, and what the dinner menu is for that evening. These are things that I find important to keep track of. You may have entirely different priorities, and that is just fine! 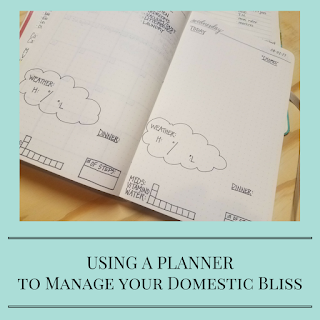 I hope this little peek into my daily planner helps to give you an idea of how it can help to plan your own way to domestic success. 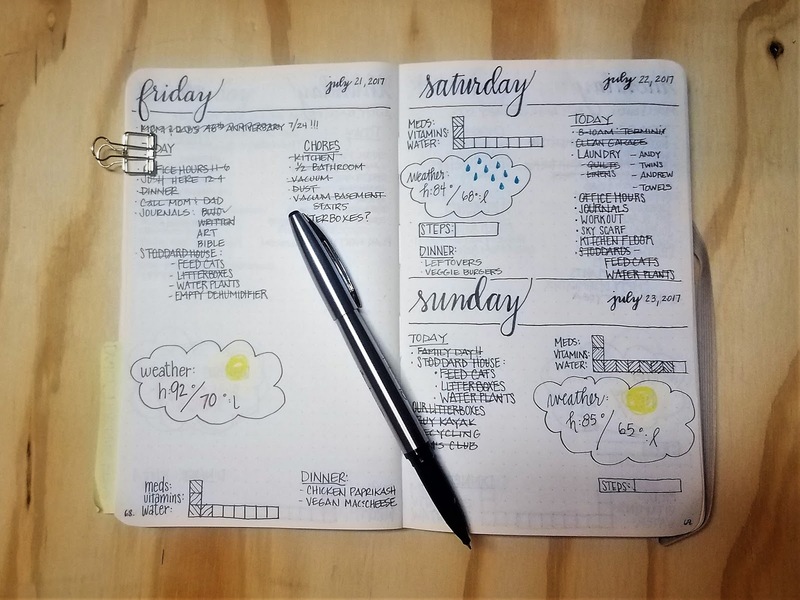 For more ideas, try searching Pinterest or Instagram using the terms bujo, bullet journal, planner, and such. 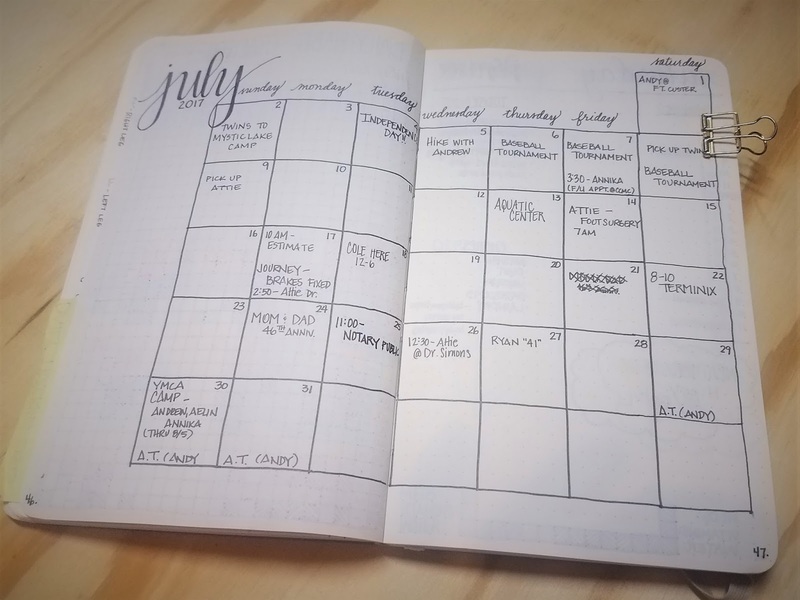 You can find some amazing examples of layouts and uses for planners there! I do this all the time for inspiration in my own!